Meteor provides lot of useful commands for simplifying development process. 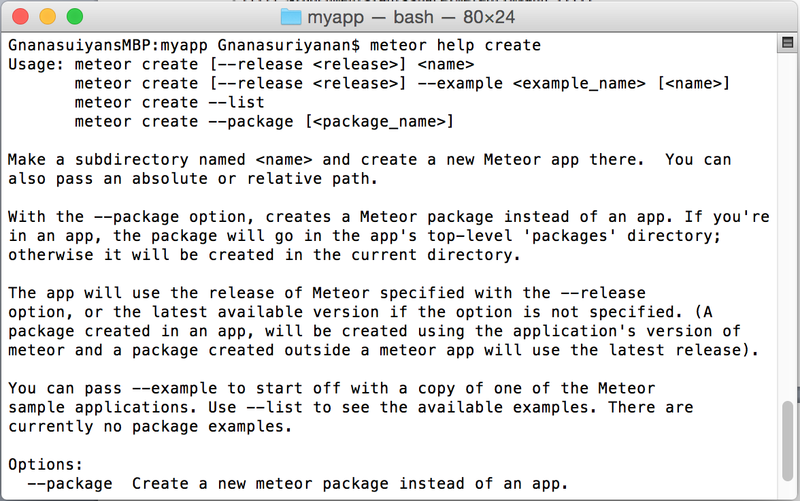 This is very simple introduction about other meteor commands. 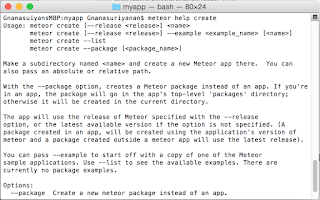 1. meteor help – This command is used for understanding purpose of other meteor commands. Example – I got the purpose of create command by using help command. 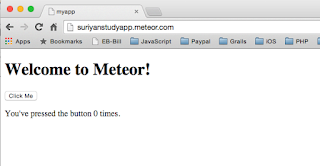 3. meteor deploy <<site>> - This command is really useful for deploying application. Meteor provide free hosting and you can deploy application in <<appname>>.meteor.com. If someone already used app name then you will have to use different application name for deploying. Let me deploy my application and it will take a while for deploying. It is deployed successfully and for verification load the URL in browser, which we have used while deploying the application. 4. meteor update – This is used for updating meteor version used by an application. You will have to run this command from your application folder and make sure you are upgrading other packages for avoiding compatibility issues. 5. meteor add – This is used for adding new package into the application. 6. meteor remove – This is used for removing previously added package from the application. 7. meteor search – This command is used for searching available packages in meteor. 8. meteor mongo – This is used for opening MongoDB shell command for modifying mongo database collection. Meteor internally use mongo-db for saving data. 9. mongo reset – This is used for resetting current project to fresh state and it removes all local data. 1. All CSS files are sent to the browser and in production mode it is automatically concatenate and minify the source files. 3. HTML templates are compiled and sent to the client. Actually meteor provides some directory structure for securing and improving performance of the application. /public – The files in public folder are served to the client as-is. So this is good place for keeping our static contents like images, and fonts. /private – The files in private are not sent to the client and also contents are loaded only when access through Assets - server side. 2. 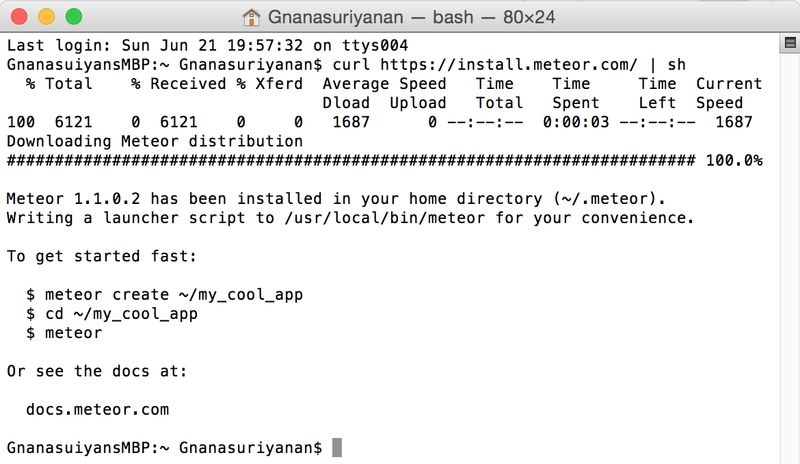 Steps for Installing and Configuring meteor. 3. 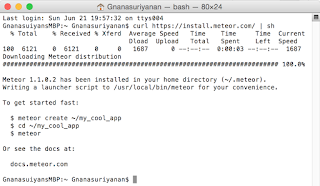 Meteor available commands and corresponding usage. 4. Directory structure of meteor application and deploying meteor application. 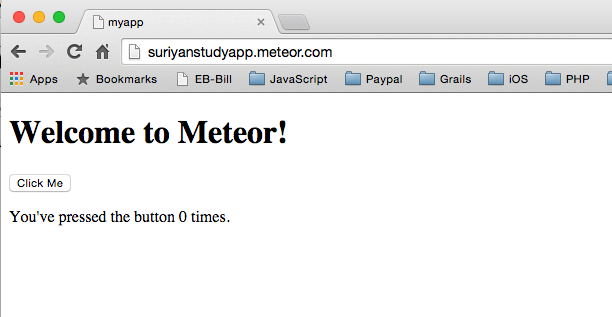 In my next tutorial, I am going to explain building mobile apps by using meteor. Good start Gnana. Nice information. Thanks. Bookmarking pointerunits. In the provided information i agree our all information and really very nice all articles ,thanks for sharing in this post. Great. I also recommend you to use ideals virtual data room for your data protection. It will help to save your code from stealing and other troubles! that time I want you to search web browser I see our sites all content is really good.In this my first post our sites.Well Done good job, it's a very useful knowledge topics.